Screened as part of Odeon’s “Screen Unseen” program – where basically the cinema chain holds off on revealing what the film actually is until the BBFC certification pops up at the beginning – Alice Winocour’s French-language Disorder is considered to be, like the many films shown previously in their covert program, an example of films that are destined to be remembered and talked about by audiences long after it’s had its theatrical run. A noble gesture, undoubtedly, but we reckon the real reason why people will be talking about this film for months to come is actually because they won’t be entirely sure of what kind of film it actually is – a sentiment that even Disorder itself shares. We follow French army veteran Vincent (Matthias Schoenaerts) as he returns home after presumably going through some explicit traumatic incidents, and despite being diagnosed with heavy PTSD in an early scene with a doctor, he takes up a security job at the home of a wealthy Lebanese businessman (Percy Kemp), leading to him being asked to protect the businessman’s wife Jessie (Diane Kruger) and their young son Ali (Zaïd Errougui-Demonsant) while he’s away for the week. Now, the PTSD angle gives the film a very open opportunity to explore the inner circulations of Vincent’s mind while he’s carrying out this important task, and whether or not he’s mentally sound to even be in that position in the first place. Several early scenes allude heavily to this, whether it’s lashing out at a rude guest during a lavish party at the house, or driving on the wrong side of the road to avoid whom he assumes to be someone tailing him, Jessie and Ali; all these scenes, accompanied by an inventive score that incorporates uncomfortable scraping noises to the beat of the music, show this guy to be very unhinged and clearly not right in the mind, and they seem to set things up for an interesting climactic showdown where everything bubbles to the surface and the man who he’s been suppressing all along finally joins the party. Or at least, it WOULD be interesting if the film didn’t all but put everything to one side in lieu of something else. Right around the midway point – and if you end up seeing it, you’ll know which point exactly – the more interesting focus on the psychological aspect is side-lined to make way for a more straight-forward home invasion movie. Without giving anything away, certain events have made Vincent, Jessie and Ali highly vulnerable, with not even the authorities seeming interested in protecting them (for questionable reasons), and from there it becomes a tense and sharp battle with external forces, while only occasionally bringing back up the psychological aspect. When it is that kind of film, it’s not bad – it’s decently directed, and for the most part you can tell what’s going on – but it’s honestly a little bit of a shame to see all that build-up from earlier in the film be virtually ignored in favour of something completely different, especially when it all seemed to be going in a fascinating direction as well. To be fair, it’s not disregarded entirely; several moments in the climax do call back to his unstable nature, and an ambiguous ending serves to provide more questions than it does answers, even though it might leave the audience in a somewhat confused state. All throughout, though, Schoenaerts gives a strong subtle performance that leaves you wondering just exactly what’s going on in his warped mind (or maybe that’s down to the actor’s stoic expression during the majority of the film), and though chemistry between him and Kruger may seem non-existent, it’s not the kind of film where there needs to be a mutual connection anyway (except for, again, a slightly questionable ending). We can understand Odeon’s desire to show this as a “Screen Unseen” for unassuming audiences, and they might be correct in assuming people are going to remember Disorder in the future – but only in that they are going to be wondering just what kind of movie it actually wants to be. 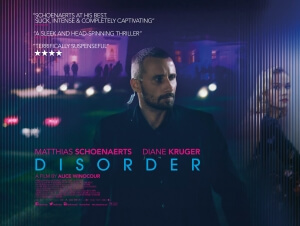 Disorder sets itself up to be an interesting psychological thriller, an element which the film handles fairly well, but then disappointingly turns into a standard and not-as-interesting home invasion movie that nearly undoes everything that it was moving towards in the first place.